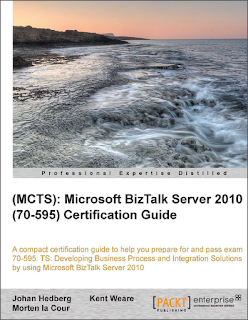 I got the opportunity to review the book (MCTS): Microsoft BizTalk Server 2010 (70-595) Certification Guide published by Packt Publishing, a company that is pretty well renowned for their good collection of IT books. The book itself is written by Johan Hedberg, Kent Weare and Morten la Cour. I received the book just before the weekend and spent the spare time over the next few days reading it through and checking out the exercises that accompanies the book. As the book both exclaims on the front as well as the writers themselves add in the first chapter, this book is a guide to help you study and prepare for the latest BizTalk exam called 70-595, TS: Developing Business Process and Integration Solutions by Using Microsoft BizTalk Server 2010 which I wrote about last year, but still have left to take due to too little time. 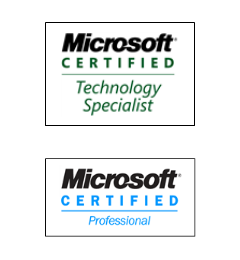 Since the prerequisites for the exam is that you should have at least two years of experience of working with BizTalk solutions, the book aims to be a quick guide to many areas of BizTalk development making the focus the parts you need to be able to complete the test. The book is structured accoring to the areas covered by the exam in order to give you a better chance of focusing on the areas you lack expertise in as well as knowing the structure on the test. Chapter 1 through 8 will cover the technical bits of BizTalk, and does a very good job at this. Each chapter will end with a few questions making sure that some vital parts of the chapter has stuck, as common with IT books. These chapters reflects the major topics that the exam is composed of, making it a breeze to know which areas you need to study more thoroughly. When starting reading the book, I immediately got the feeling that the writers didn't quite stick to the view of the readers having more than two years of BizTalk development and hence not having to run through simple tasks that you learn during the first hours of a basic BizTalk course. Pretty much the entirety of chapter one is like this, and parts of the other chapters as well. But that is a minor fluke since most of the book contains just the right amount of information, or maybe a tad to little. Just as Mikael Sand mentions in his review, there are parts of the book that will tell you how to do things, but not why. I also have to add that there are parts that while describing a satisfactory way to solve the problem, it doesn't adhere to best practice. In other places, the writers will push you in the direction of complying with the established non-formal best practice in a very good way that is seldom seen in books of this type (SOA Patterns With BizTalk Server 2009 by Richard Seroter is one of few exceptions). After the technical chapters, you get chapter 9 and 10 which gives you a more hands-on preparation of the actual test. Chapter 9 runs through tips on how to study for the test as well as how the actual test will take place. Chapter 10 is a collection of more practice questions that will mimic the real ones. Now, bear in mind that I have yet to take the 70-595 test. 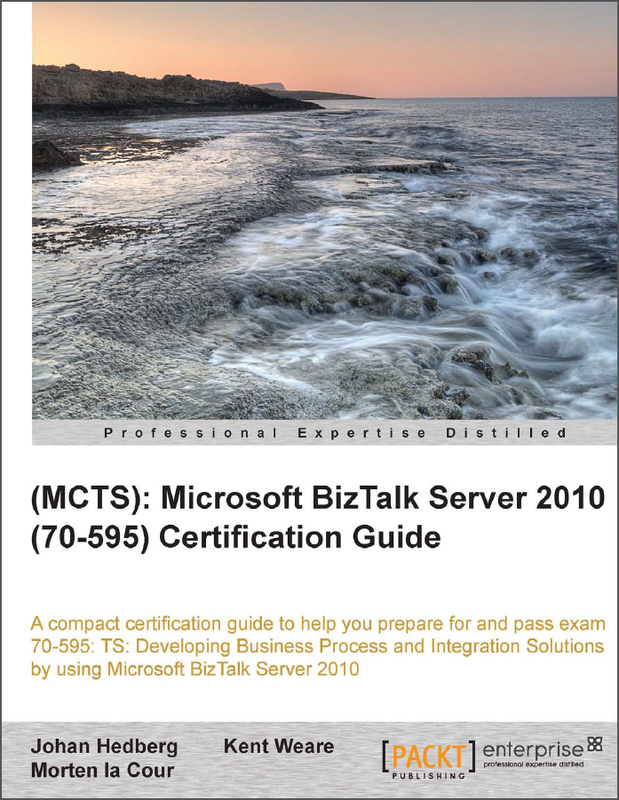 I have however taken the 2006 version (70-235) and can say that based on my knowledge from that test as well as my knowledge from BizTalk development and architecture, this book covers the major parts in a very good way. I believe myself that a good way of studying for the test would be this book, reading it through, having a BizTalk setup to do labs and practical work in, and then of course a browser with MSDN/Technet available for all that in-depth knowledge hunting that I think is a must. It's simply just not good enough to know how you do something, you also should know why you should do it that way, and in which way that will affect your platform and solution. The book does a pretty good job at this by every now and then redirecting the reader to MSDN for more information. All in all, this book actually surprised me as soon as I got past chapter 1, and I can recommend it as a good study guide to aid you (alongside the vast resources found online) to successfully complete the 70-595 exam.